San Carlos condos are located on the Alabama Gulf Coast in Gulf Shores Alabama, the complex has 142 beachfront homes that make an excellent primary residence, vacation home or real estate investment (with benefits); the floor-plans at the Gulf Coast complex include two-BR units that average 1200 sf, three-BR units that average 1400 sf and four-BR units that average just under 1600 sf. - construction on the complex was completed in 2007. Amenities include 1800 square feet of meeting space with a full kitchen overlooking the beautiful beaches in Gulf Shores, great for wedding and family reunions. Plan a day in the surf, or enjoy relaxing in the large beach-side pool. San Carlos also includes a full fitness room with floor to ceiling windows, with excellent views of the sugar-sand beaches. 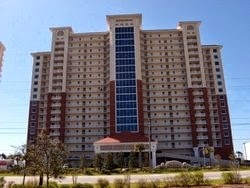 San Carlos condominiums in Gulf Shores on Alabama’s Gulf Coast is a 20 story building with 17 stories of beachfront condo homes; its’ central location makes it convenient to many of the areas outdoor activities and many dinning/ shopping venues. Some of the amenities at San Carlos include a gulf-front pool, exercise-room, outdoor hot-tub, wireless internet, meeting rooms, a sauna, steam room and more. Residents and guests enjoy 370 feet of the sugar-white sand beaches overlooking the emerald waters of the Gulf of Mexico. San Carlos condos are great as a second home or beach real estate investment with perks - visit this popular complex and see why so many make this a home away from home.